Scott Soshnick | Bloomberg Media Talent | Bloomberg L.P.
Scott Soshnick joined Bloomberg News in 1993 as a reporter and columnist. 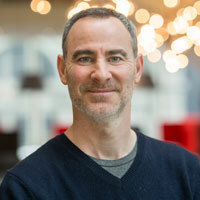 Soshnick spearheads Bloomberg’s sports business coverage and co-hosts Bloomberg’s Business of Sports radio show and podcast, which he created. Soshnick was Bloomberg’s national NBA correspondent from 1998-2005, covering breaking news and reporting on all facets of the league. Bloomberg launched a number of sports business-related initiatives during Soshnick’s tenure, including television, radio and magazine segments devoted to topics that affect leagues, franchises and fans. He is a frequent contributor to ESPN’s Outside the Lines and SportsCenter programs, as well as SportsNet New York’s Daily News Live. Soshnick was Bloomberg’s national NBA correspondent from 1998-2005, covering breaking news and reporting on all facets of the league. Before joining Bloomberg, he served as an associate producer at WFAN radio in New York, conducting interviews for on-air play and securing guests at the nation’s leading all-sports station. Soshnick graduated from Syracuse University in 1992 with a B.A. in broadcast journalism.